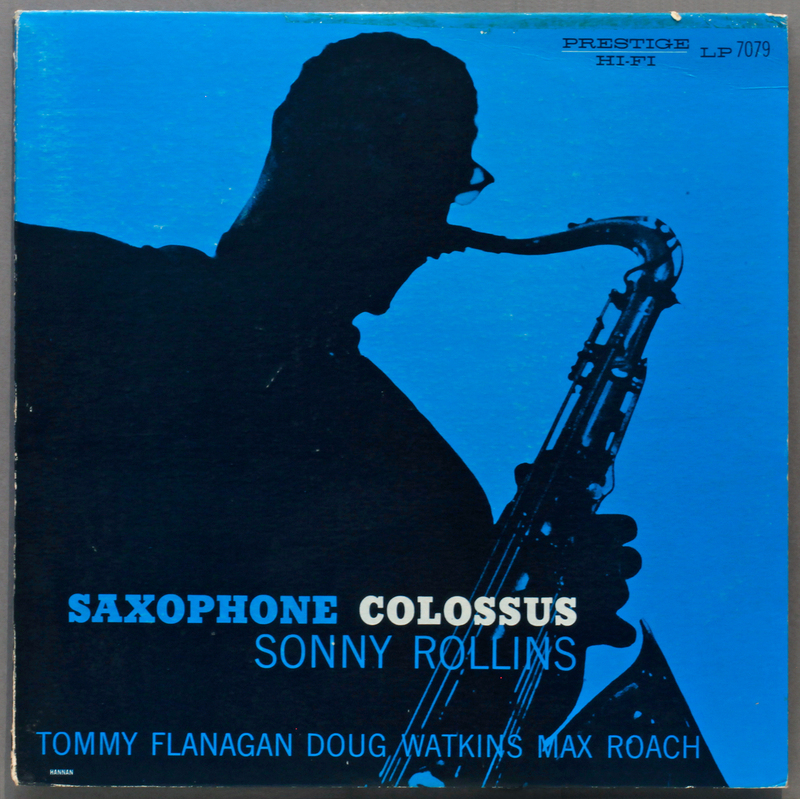 I guess there are may be three records every jazz collector must own as good a copy as they can find and afford: Coltrane’s Blue Train, Miles Davis Kind of Blue, and Sonny Rollins Saxophone Colossus. No doubt you can name a few more, but to my reckoning they are the must-haves. The UK CBS release of KOB is a non-starter compared with the Columbia six-eye. With Blue Train you have no option but Blue Note. The Rollins, however, does offer an alternative candidate: UK Esquire. Let me draw on my namesake and original inspiration, Jazz Collector:, who wrote just over a year ago about the “European edition” of Saxophone Colossus. 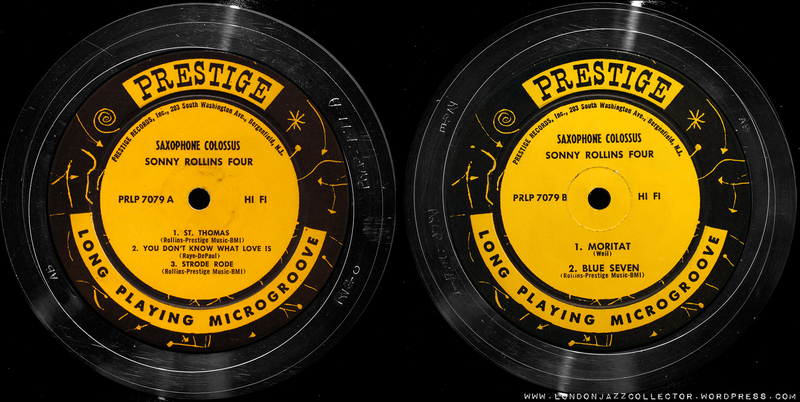 “Let’s catch up on some more jazz vinyl we’ve been watching on eBay, starting with: Saxophone Colossus, Sonny Rollins, Esquire 32-045. This was an original UK pressing listed in M- condition for the record and between VG++ and M- for the cover. It sold for $358. It seems that the prices for these original European pressings have been getting higher and higher in recent years. I imagine, for many collectors, these would represent second copies, along with the original U.S. versions? Or perhaps for newer collectors, this record at $358 is a lot more affordable than a U.S. original at $2,000? As noted in some of our recent posts, some of us prefer to avoid the risk of Prestige flirtation with recycled vinyl too. My later Prestige gold label hisses throughout, though this second pressing has no problems in that department. Jazz Collector diplomatically skirts around the “which is better?” question, and throws in a “some people say” line which acknowledges the debate without taking sides, always a safe option. Fearlessly, I’m going for broke. You decide. Soundcheck: previously posted US second issue on original Prestige, same track, though there may be differences due to the difference in turntable in use at the time of the earlier rip. I’ll replace with like for like in the next few weeks, but for now, take it as it comes. The etchings on the Esquire are fiendishly difficult to pull out. They are all there – RVG by hand, Abbey Manufacturing AB, original Prestige matrix PRLP 7079 A and B, but only the stamped elements – arrow shape on side one around six o’clock, and the stamper or mother number “1” at 3 o’clock – catch the light. Anyone knows what the arrow stamp signifies, share your knowledge. The hand etchings are shallow and they stubbornly refuse to shine. None of this affects the groove pressing, which is bold and bright as you would expect from this superior recording. Five years. That’s about the time I have waited patiently bidding on copies of the Esquire edition of Rollins Saxophone Colossus, losing every time. On this occasion it went my way, and thankfully by a comfortable margin less than my actual bid. Sometimes virtue is rewarded. Now, an open question, prompted by a conversation with my plumber, Jason. I had stuff belting out the hi-fi downstairs while he was working on the bathroom plumbing upstairs. 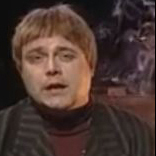 After each album he would politely ask: Who was that? I like that. Seems he knew his way around the genre a little, but says he was disappointed with his own efforts to choose the right records, not knowing what artists to look for, finding it all a bit too much. I named three jazz albums that I think every modern jazz collector should own. As it happens he knew my three recommendations well, he’s not a complete beginner. The question is, aside from KOB, Blue Train and Saxophone Colossus, what else? I’ll offer you the chance to recommend five records to my plumber, who is a relative newcomer to jazz, who would like some pointers. The best record from five artists who represent a significant and distinctive body of work, rather than more of the same. And remember, as in life, there are no right answers, but there are plenty of wrong ones. 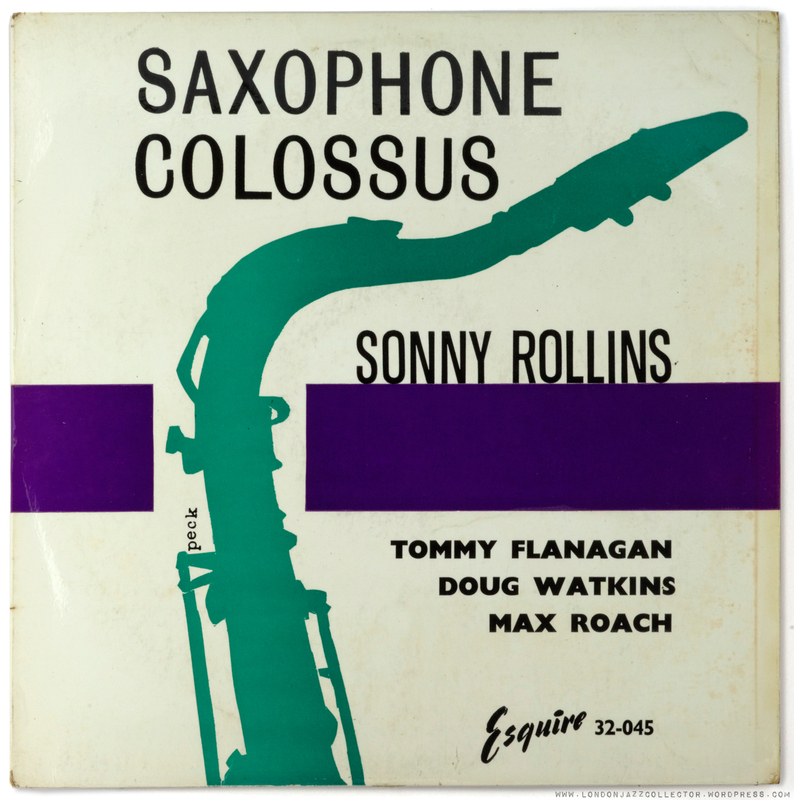 This entry was posted in Esquire, Sonny Rollins and tagged Doug Watkins, Esquire, Max Roach, Prestige, Sonny Rollins, Tommy Flanagan by LondonJazzCollector. Bookmark the permalink. What about the Analogue Production RE of the same album? From limited experience I do not recommend Analogue Productions. Some people like them but I find them “bottox-finish”. This may be the exception, however I’ll stick with pressings from original metal. I find modern re-issues generally a disappointment when you pitch them against an original, which I have none a couple of dozen times. Unless you have done that comparison, there is no way to form a judgement on which sounds “better” to you. The only exception I have found is Music Matters 33, which I have found come close, though I generally prefer the original, which is not an option for many people. glad to see in a list of Giants, a seldom quoted one. maybe it’s the youngest among mine, recorded in 1977 but published in 1981, after Evans’ death. among the hundreds of his recordings, this Warner Bros trio, HS 3504, is a real masterpiece, cheap on the market, great in emotions. I found recently a (first ?) 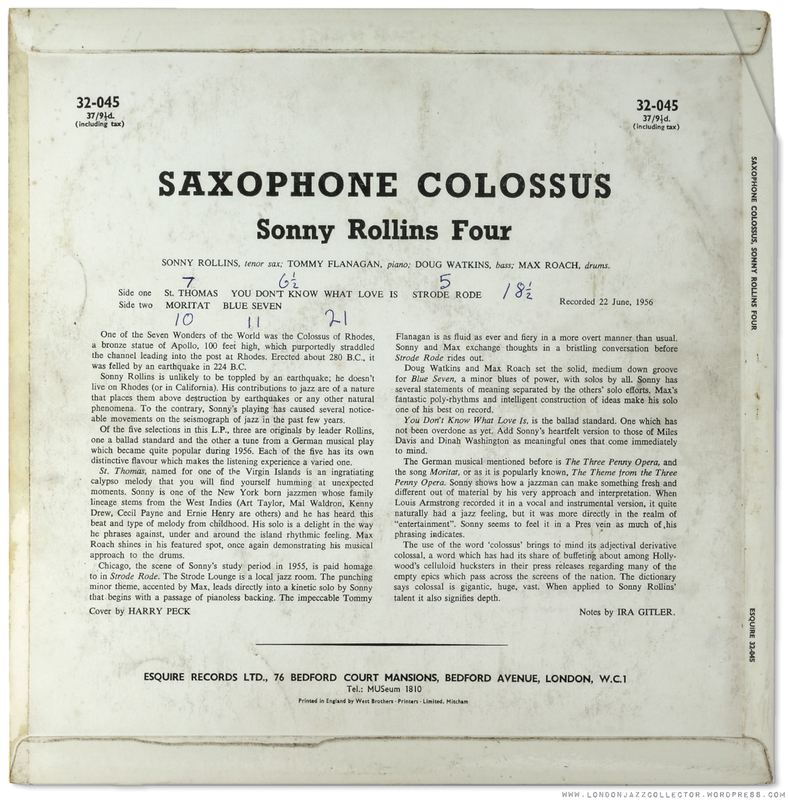 french press of Sonny Rollins ‘s saxophone colossus. This is a Barclay “Le colosse du Saxophone” 84084 S with a J.P. Leloir photo on cover. I couldn’t find no date of this pressing but I think this is at the end of the 50ies maybe 1960…. There is also RVG by hand, Abbey Manufacturing AB, original Prestige matrix PRLP 7079 A and B. Prestige Master is indicated on the label. There also stamped the “1” and the arrow you mentionned. Moreover there is two code number stamped, I think this is the Barclay’s reference. The cover is in flexible cardboard, not so beautiful as UK ou US pressing but the sound is excellent. I found it in a little record shop in Paris… it costs me €24….in excellent condition. For me, this is a complete rediscovering of this monument of jazz. Is it by any chance a relative of this? I have never had enough information to understand Prestiges other European licensing arrangements apart from Esquire. . It’s all Greek to me. Anyway, good to hear of another source of this great record. The US original copies are way too expensive for ordinary folk. I can hear absolutely no difference. I had a co-worker chose which one to play first and second so I could do it blindly, and I was convinced she had pressed play on the same file twice by accident. As a professional jazz heretic: I would say that, while excellent classics, none of those three records are what I would choose as my three mains. I think Miles did other Columbia albums with more fire and zest, and Coltrane’s Prestige and Impulse work run circles around this middle-year stuff. Rollins is simply not someone I idolize as others do. I know, I know. My favorite tend to be early Miles, Charlie Parker, Columbia-era Mingus, and the freedom gang. I liked your comments, Gregory. However, I think Coltrane’s Atlantic work is tough to beat, and even though I admit that it did take a while for me to warm up to Blue Train, I did, and at this point I’d say I like it just as much as his work with Miles on both Prestige and Columbia. I personally wouldn’t point someone in the direction of A Love Supreme as an introduction to Trane though, as what I’m hearing on that date is a highly evolved artist that may not be as easy to digest or understand as the Trane of 1960, for example, especially for a “novice”. I have heard arguments like this a la A Love Supreme before and I think that, while well intentioned, they fail to take into account many things, and might even be a little snobby (but you know I love you, DG). I had heard tons of jazz of all stripes before any of it really took hold, and what took hold was not any “introductory” or “basic” class, but the Art Ensemble of Chicago’s “Baptizum”! That was my first love in jazz. The jazz door is in different places for different people. A Love Supreme is so far-reaching in its scopes, I would consider it a great introduction. Some would even say they could dance to it. Or other things. Not that I would know. A Love Supreme was the first jazz LP I purchased about 8 years ago and was what sparked my obsession with jazz, and especially Coltrane. There are great Coltrane recordings both before and after A Love Supreme but this, for me, is THE essential Coltrane album. Blue Train is classic for sure, but it is a very Blue Note sounding album of which you could add many to the list. Perhaps taking one step back from A Love Supreme for a beginner would be Live At The Village Vanguard. This is probably the record in my collection I reach to most often. Africa Brass was my first jazz record and A Love Supreme the second when I was 13. This sequence made ALS seem like easy listening. I had a harder time getting into Ellington and Parker at that age. Interesting comment. I’m yet to do a serious survey of Parker’s stuff (chairs thrown) but I definitely plan on doing so soon! OOOHHHH let me suggest “The Charlie Parker Story”, which is one of the first records to feature outtakes and multiple takes. That album lurched me forward in my Charlie Parker love. Of course, any Bird on savoy is good. “The Genius of Charlie Parker” 2 LP set is great, too. mmm, wanna enter Trane’s world? as stated in another post, Coltrane is #1 for me and I have almost everything published, even useless records. DG Mono asks for an unheavy Trane: immediately comes to mind his only flute work on Expression, or Naima, or Alabama, or Lush Life, or the album with Johnny Hartman, even the one with Ellington. but if the definition was about Hard Bop or Free, ok, Trane was heavy, and I do love heavy Trane. In a world where we lived next door to each other, we’d be best pals, you and I! I told someone recently that Coltrane was my favorite everything. My favorite chef. My favorite color. My favorite website. Everything. Love that dude. To be clear, I definitely love me some heavy Trane too, Dottor. That’s funny because I think Village Vanguard is particularly heavy too! I know the Vanguard album is a classic but I actually prefer the Birdland album on Impulse. Side 2 is a bit more heavy than Side 1 on Village Vanguard, but I think compared to Birdland it’s pretty tame, but you are right that it is a matter of taste and perception. Having just a 1972 red/black Impulse! copy of Birdland that doesn’t quite “speak” to me, it hasn’t received much play on my system. Maybe that will be my next focus for an upgrade. That album is fabulous. No doubt about it! Interesting set of observations. I firmly believe you learn as you listen. If you haven’t listened to a particular record for some time (who says they are innocent?) then your musical palate may well have altered as a result of all the other records you have listened to in that time, let alone improvements in the hi-fi system. Records have gone up and down in my estimation, my comfort zone has altered, re-listening is a good fact-check. There is a basic tennent here to my mind: there is no prize in consistency, and no shame in changing your opinion. Rather, the reverse. What I liked when I was thirteen and like to listen to today have some distance between them. Hank Marvin. The Shadows. Man of Mystery? It’s not Love Supreme is it? Damn right it is. I lavished hours trying to play like Hank and learn the solo on my prized new electric guitar, a Hofner Galaxy. It had a tremolo arm. Great. I had no inkling of the likes of Coltrane at that time. Tell him not to come back until he’s studied each one of these recordings intently for a light introduction into the world of smooth jazz. You guessed right. No Rock. But I’ll let you have your airspace just this once. I will need to give this a closer listen, but surprisingly it sounds like the pressing quality is better on the US Prestige. Congrats on the score, LJC! I love hearing stories about patience with eBay paying off eventually. I actually couldn’t hear a whole lot of difference between the two pressings–did you use your cheaper turntable to record the Prestige drop?? And you should totally do blind tests in the future, that would be tons of fun!! I think all the dates above are relatively “digestible”, meaning the musical ideas don’t get too crazy, which I think it probably a good way to introduce someone to the genre. I cheated a little by adding two Nichol’s but to me they are one connected album on two 10″ discs. All titles veer toward Avant Garde but are still firmly rooted in the traditions. I baulked at including another Davis record, but the man’s career was so long, rich and varied I don’t think it can be avoided. Green Street – Grant Green. Blue Note. This Is Our Music – Ornette Coleman. Atlantic. Cookin’ with The Miles Davis Quintet. Prestige. Boogie Woogie Classics – Albert Ammons Memorial Album. Blue Note. 5 great choices IMHO, nice picks! And as a bonus track, should he feel homesick, Waltz by Frédéric Chopin from the CR album “the Arrival of Victor Feldman”. The same question is frequently asked by my patients in my office where I’m used to have music on whenever I’m there. and the answer is simply impossible: musical tastes can be so different. I like Free Jazz, but it would be silly to recommend it to a newcomer. I thought I knew them all – and then you come along with that Warne Marsh thing, Dottore! Sadly, my only source at the moment is Youtube. And much to my surprise, these 1956 tracks were recorded in stereo (anathema for you, if I remember correctly). Anyway – very, very good music it seems. Thank you. anathema? ah, the session was recorded in stereo AND mono, I’ve got mono, of course. ‘Radio Recorders’, Los Angeles, CA., Oct. 3 (IM-1159/62) & Oct.11 1956.(Prod. Albert Marx). Warne Marsh, Ted Brown, ts; Ronnie Ball, p; Ben Tucker, b; Jeff Morton, d.
3-a LOVER MAN no number alt. take, unissued ? 4-a EAR CONDITIONING no number alt. take, unissued ? In the recording studio 2 sets of equipment were running, concurrently, for mono and stereo recording. The “stereo set'” was not intended for release because of the very few home-stereo equipment in use, and was stored as such. After recording alternate takes of (at least) 4 titles, the following was decided. A: Marsh preferred his solo of “4-a” ( Ear Conditioning, unissued. ), and that part was spliced with “4-b” resulting in “4-c”. (This “4-c” becoming the ‘original’ mono release on : Imp LP-9027and its equivalents.). B: Ball preferred his solo of “3-a” (Lover Man, unissued), and that part was spliced with “3-b” resulting in composite “3-c”. ( Also as previously mentioned for Imp LP-9027.). C: The takes numbered IM-1202 (item “6-a”) and IM-1203 (item “7-a”), were also chosen (unspliced !) for the original mono release on Imp LP-9027 together with items 1,2,5,8. D: The “stereo-set”, containing the original stereo recordings of items 1,2,5,8, and the “out-takes” 3-b, 4-b, 6-b, and 7-b was issued later by Imperial as Imp (S)LP-12013. E: The equivalent of this “stereo-set” (Imp (S)LP-12013) is released on CD in 1993 by Toshiba-EMI-Liberty numbered TOCJ-5444. Note-2: Matrix numbers assigned by Imperial label. (NB.. This numbering system gives the impression that the unissued alternative takes were not numbered, and that IM-1161 and 1162 must belong to “3-c” and ‘4-c”, the composites for the original mono release). Note-3: Item -h (These Are The Things I Love) also titled “Tchaikovsky’s Opus 42, 3rd Movement”. Note-4: The -small- differences in duration are rather due to playing- than recording equipment. all but 3-a, 4-a (both uniss.) CD Cap CDP 7243 8 52771. …such as Telefunken Blues, just to name one. Jazz of two cities has a different cover from The winds of Marsh: no pin-up. Yes, I know. It’s the clockwork cover, looks nice! congratulations on this new acquisition. 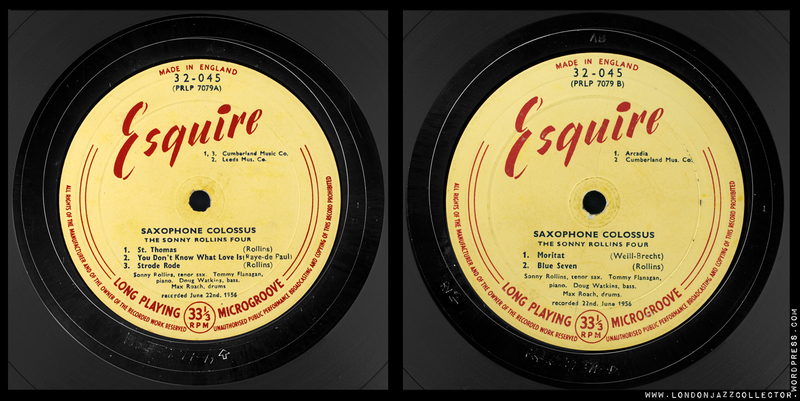 Nota bene: the Esquire is also a second pressing (37/9 1/2 price and without broad spine), so the comparison is even more equitable. Thank you for spotting that, of all people, I should have known! The seller provided a photo of only the front cover, I should have asked about the back cover, but questions can alert the seller or other buyers to something that can and often does work against you. One time, I asked a question that alerted the seller they had something more valuable than they thought, and it was immediately withdrawn from auction! As regards 1st and 2nd Esquire pressings, the same stampers may been put back into service for a further pressing run, one can not rule out the suspicion they will exhibit more progressive stamper wear than the first run. Of course, they could have been sent another set of stampers. This is in the realm of the known unknowns. Fortunately, I am not fastidious as regards “1st pressing status”. Mostly.